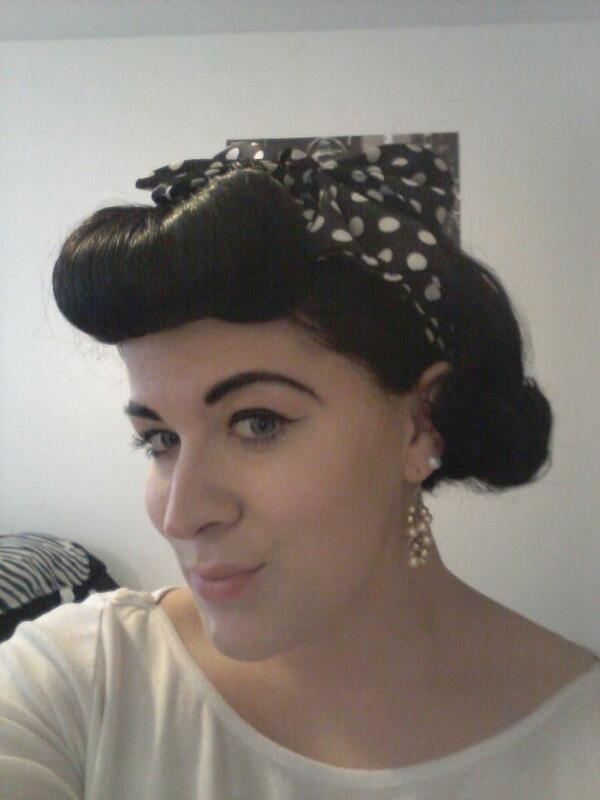 I'm pretty pleased with the result though the process took about 45 minutes (just to curl and pin) prior to styling. 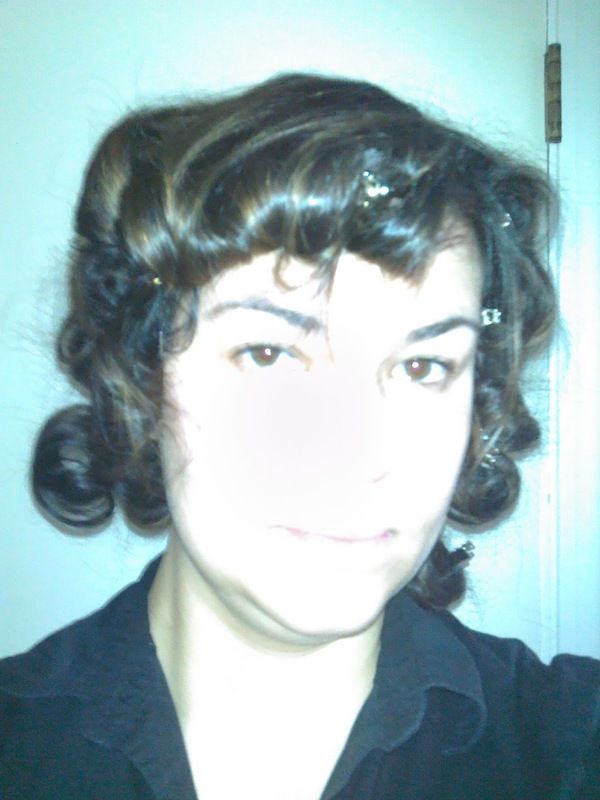 To achieve this look I used the method Cherry Dollface uses of pinning curls immediately after curling, also I used a half inch curling iron. She shows this method on almost every tutorial. Also, I watch most tutorials repeatedly prior to attempting, I'm no Houdini or hair genius ;) The front bang curl is a variation of her barrel roll and/or the large spit curl. 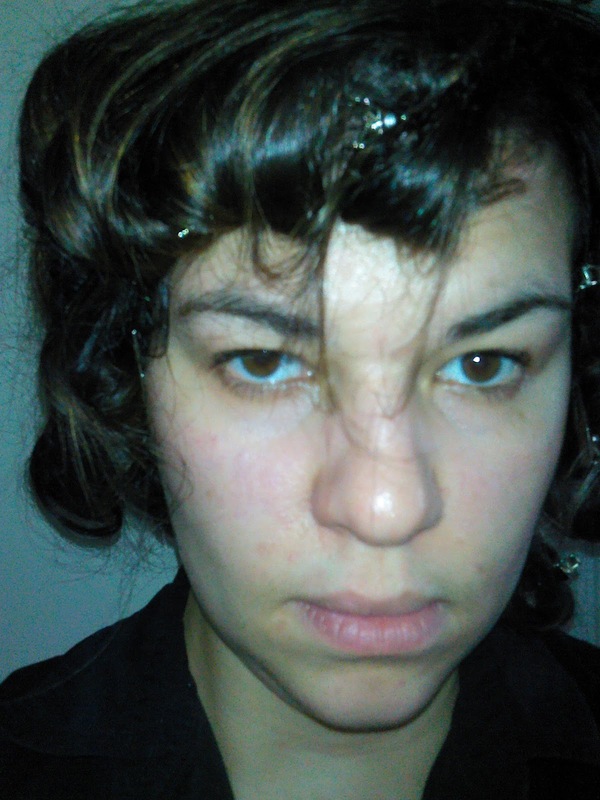 I was a little frustrated that some of my hair did not wish to roll up into curls and just hung out. 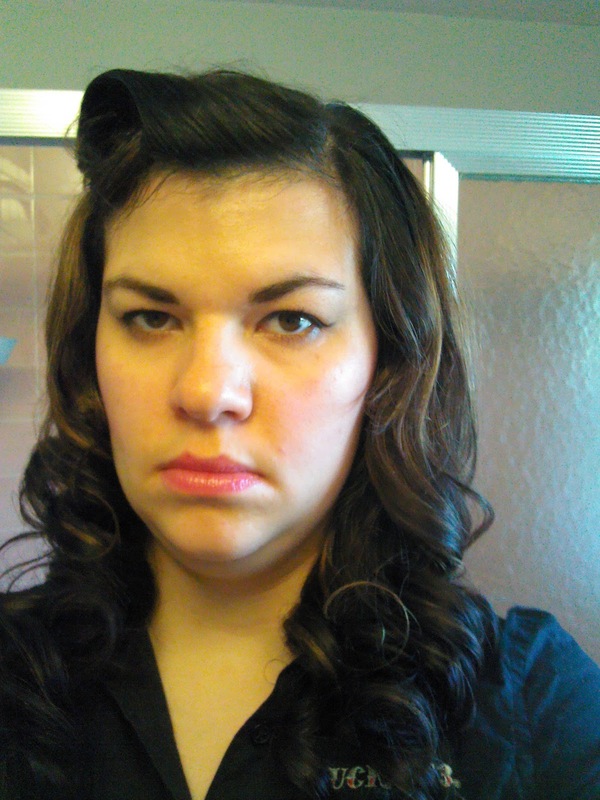 My pin curls did not look as neat as Cherry's but then this was my first attempt. I'm pleased that I didn't stop after I got frustrated with my hair/skill level. As for the hair I washed it the night before so it wouldn't be fresh or as fresh. After washing I let my hair air dry and I apply Beautiful Curls curl activating cream. The instructions on the bottle suggest using the cream from root to tip of the hair. I did that once and never again since it made my scalp super oily. I put the most emphasis on the tip of the hair but evenly disperse the cream throughout the hair taking care to not put it on/near the scalp. We're both novices when it comes to styling hair but I'd say we succeeded. Marie said it took her about an hour and a half for the bangs. It'll take less time the more we practice. She's such a doll. She looks like Liz Taylor! You should have smiled in the first picture at the top! Your hair looks gorgeous!!! aww, Marie!!! She should have played Elizabeth Taylor...not Lindsey Lohan, lol. I looked goofy in the ones where I smiled, but thank you :) I've been using my tablet for photos because I think my camera broke (or its batteries were really low that day). Anywho, it's kinda awkward. I agree Marie should have that role instead of Lindsey Lohan. I'm in favor of that change.